Making a gift to Riley is one of the most powerful, immediate ways you can make an impact on children. Individual donations of $1000 or more – in one payment or spread over multiple payments – is considered a Riley Society level gift. The collective impact of Riley Society gifts ensure that Riley Hospital can continue to revolutionize care and seek cures. Many employers will match your gift to Riley as part of their corporate policy. Does yours? Type your company's name below and find out. You can make your gift in honor or in memory of someone who is special to you. Look for the “Tribute Information” section of our online donation form and indicate the name of the person you would like to honor with your gift. We will ask you to provide the address of the honoree or their family so we can notify them of your gift, however, the amount will remain confidential. The Riley red wagon represents the family-centered care provided at Riley Hospital for Children at Indiana University Health. Red wagons help families navigate Riley Hospital, and bring children smiles during what can be a stressful time. With your philanthropic support, you or your group can name a wagon. A license plate acknowledging your contribution will be attached to the back of a wagon and you will receive a duplicate copy of the plate. Wagons are named for the duration of their circulation at the hospital, up to one year. Based on inventory, named wagons may be new or gently used. 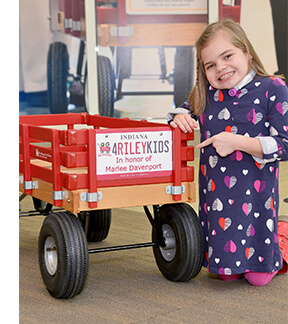 Funds from named wagons are used to support Riley Hospital’s greatest needs. Upon request, a donor can direct funds to patient care, pediatric research or family support programs such as Child Life. A portion of each donation ($200) provides maintenance for wagons. If you are not ready to make a donation at the Riley Society level, you can donate in any amount HERE. 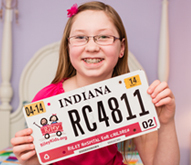 Every single donation to Riley Hospital for Children – large or small – is a gift of hope. 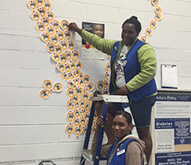 Questions about any of our individual giving opportunities? Contact Cara Lathrop, Vice President, Development at CLathrop@RileyKids.org or 317.759.6906.